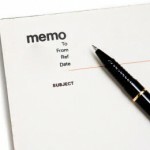 You might think that a traditional status memo is a thing of the past, but submitting a memo to your boss (even when not asked to do so) is a great way to get your work noticed and to help you set your own focus for work yet to come. Click here for a sample memo format that Dr. Brannon uses with her own research group. “Business Memo Format.” Sophisticated Edge. N.p., n.d. Web. June 17, 2012 . . This entry was posted in Thoughts and Tips and tagged business, memo, success, tips. Bookmark the permalink.